When given the opportunity to review the Glee Gum’s Make Your Own Candy Kit, I was excited because not only do I like LOVE Chocolate, but I LOVE the opportunity to do family activities that will allow our family to spend fun, quality time together. These activity kits are all-natural, educational, and eco-friendly. With pre-packaged ingredients and easy-to-follow instructions, everyone aged 8 and up gets a real kick out of making candy from scratch. Focusing on the history behind and the origin of these candies, each kit is designed to captivate your interest, connect you to the global community, and create something yummy to eat in the process! Connect kids to the global community by tracing the origins of raw materials we encounter in our daily lives. Our gum kit uses natural chicle. Our chocolate kit includes organic cocoa butter from Costa Rica, and the gummy kit contains carrageenan made from seaweed from the Philippines. Create something exciting and delicious. At Verve, we believe people learn by doing. By creating delicious edible treats with our kits, kids also create connections to each other, between various fields of studies, and to other communities and cultures. Captivate kids’ interest. Kids have always loved to stir, mix, touch and taste our great activity kits. Now children can make yummy treats while learning about: the rainforest, ethnobotany, chemistry, mathematics and measurement, ecology and environmental issues, home economics, nutrition, the oceans and more! 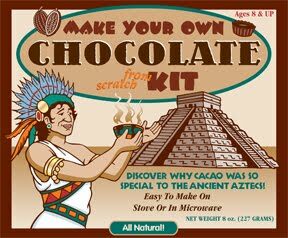 There are actually 3 Varieties to choose from: Make Your Own Chewing Gum, Gummies or Chocolate Kit…but for our family it was a no brainer, we wanted to make Chocolate!!!! 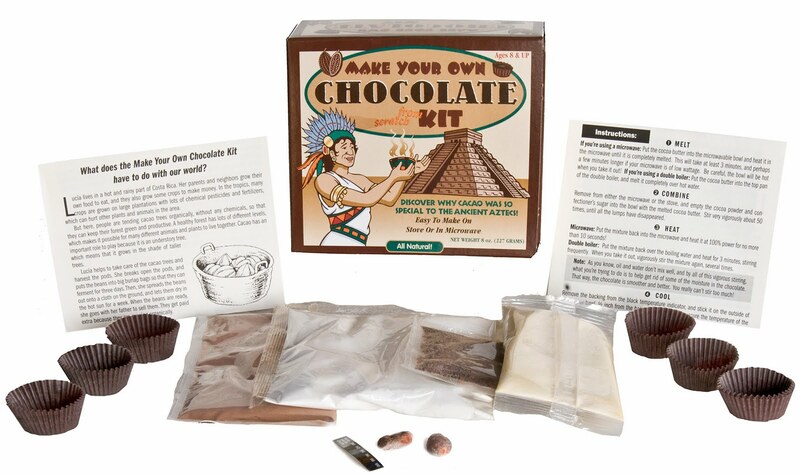 The Make Your Own Chocolate Kit comes with everything you need (including 2 cocoa beans to show where chocolate comes from) and you can always add toppings (we chose to use M&M’s). The instructions are clear to follow and easy to understand, which is ideal when doing this with 2 Toddlers. We all got the chance to contribute and not only did my babies look cute in the aprons and chef hats but they really had fun! It didn’t take too long to make so we did this right before dinner, this allowed the chocolate to cool while we were eating. The kids (and my hubby) were extra excited about desert that night. When it came time to eat our chocolate creations, they were so good that our household was actually quiet, which is rare with toddlers. My son especially loved the chocolate, he actually snuck in another piece and was not happy when I didn’t allow him to go for a third. My Family and I definitely enjoyed making and Eating the chocolate!! My daughter took 2 pieces to her teachers the next day because after all Sharing is caring…….On that Note, one Fabulous Teach Me 2 Save Reader will be able to WIN 1 Make Your Own Candy Kit. Go to Glee Gum’s Make Your Own Kits Website, and leave a comment in the form below telling us which kit you would like to try. #4. Follow Glee Gum on Twitter and leave a comment in the form below indicating you follow TeachMe2Save on Twitter. Entry is open to US Residents, 18 years or older only beginning Monday, June 6, 2011 through 11:59PM EST on Tuesday, June 21, 2011. The winner will be chosen using random.org and contacted by email. If you’re the winner, you’ll have only 48 hours to respond or an alternate will be chosen.We are not responsible for unread, undelivered emails or undelivered mail. Products (Make Your Own Candy Kit) reviewed were provided to me free of charge. No compensation was given in exchange for this review. My opinion of Make Your Own Candy Kit is my own and is an honest view of my experience with the product. Glee Gum was not involved in the writing of this post.